Calling all Squadies!! There has been an overhaul of Canada’s Food Guide and it’s something you DON’T want to miss. 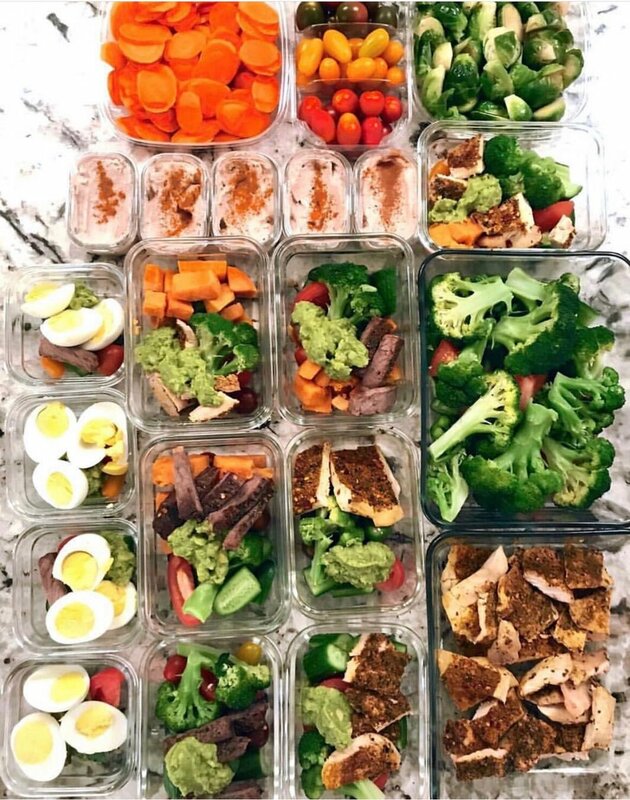 The BIGGEST Takeaway: Lean Eating is IN! First of all, even if you do not hail from Canada, the most recent Canadian Food Guide is a GREAT resource for reference! This new guide also pictures a Glass of Water as the drink of choice. The milk and dairy “group” has been eliminated completely and you will now find milk and dairy in the “proteins” quarter of your plate. The Food Guide suggests that you reduce amount of milk and dairy intake on a regular basis! Further, the “new protein category” contains (along with dairy products) meat products and plant-based proteins, the major difference being the emphasis on plant-based proteins such as tofu, nuts and beans. What is SO cool and very evident in this new food guide, is that is shows how many LEANMAZING sources of protein there are outside of the “traditional meats” category! On the LEANSQUAD we have a ton of recipes using beans, tofu and nuts that are so easy to make and SUPER tasty!! 2. Servings - On top of the well-defined 4 food groups pictured on Canada’s old food guide, was a suggested number of “servings” you should consume in a day. A major change in the new guide, is the absence of specific serving sizes, and rather a rough estimation of how much of each “group” you should have in a day. As pictured above, your meals should include roughly half fruits and/or veggies, a quarter protein and a quarter grain based foods. This holistic approach to eating is something that we believe is much more sustainable and a far better option! Water - The food guide previously suggested sugary drinks and juices be a part of your daily fluid intake. The NEW guide emphasizes WATER as the healthiest option and no longer contains any sugary fruit juices. Staying hydrated is SUPER important! Water is definitely the best choice to stay hydrated in the healthiest way possible. Eating habits and mindfulness - The new guide suggests that being mindful of your eating habits (how, when, why, how much, etc) can help you make healthier food choices. Turning healthy eating habits into a ROUTINE will ultimately help you make healthy eating into a lifestyle. On the LEANSQUAD, we talk a lot about lifestyle and creating healthy habits. This new inclusion on the food guide is something we definitely support and believe in! 4. Eating with others - Spending quality time with your friends and family is definitely super important when Livin’ lean (New apparel just launched). Eating healthy is more than just a good habit, it’s a lifestyle! Including your friends and family in your healthy eating will not only help you inspire others to make healthy changes but can make your eating experience more enjoyable. Canada’s new food guide suggests that eating together can introduce you to new healthy and cultural food options, so you can enjoy your eating experience and spend quality time with your loved ones. Ok, so how does this impact ME? As a consumer, you may see some changes in the types of food carried by your local grocery stores. I am sure you have noticed the increase of plant based products on the shelves during your weekly shops, and expect that to continue! Long gone are the days of Whole Foods (and small organic grocers) being your only option for plant based products, I suspect that almost every grocery store in Canada will start carrying several alternative plant based options! Next, I personally have already seen an increase (and I LOVE IT) in the number of HEALTHY options in the frozen section! I think companies will continue the trend and offer some great healthy options in the frozen section that will last WAY longer. Finally, as more consumers become aware of this new guide, look out for extra foot traffic on the perimeter of the grocery stores rather than the inner isles which usually house the processed foods! The LEANSQUAD sees this as a HUGE LEAN WIN! The exposure of plant-based proteins, more veggies, and water as your main fluid source are all things we promote on the LEANSQUAD! We are so excited that the Canada Food Guide is encouraging people to Lean Prep their way to success and enjoy time with family and friends! I hope EVERYONE has a chance to read over this blog (and any additional material) to see how a holistic eating approach can help you live a healthier lifestyle!! Older PostPF Changs Style LEAN LETTUCE WRAPS! !